CEo's Message Another year has flown by and weâ&#x20AC;&#x2122;re already well and truly into 2017, and, our 58th year of caring for surrendered and abandoned animals in need. This lifesaving work saw us rehome an incredible 8,622 animals last year, 234 of these in just two days during our fourth annual AWLQ Project Empty Shelter. Gold Coast Mayor Tom Tate has shared why he chooses to adopt dogs from Animal Welfare League Queensland (AWLQ). “The animal knows that you have saved him,” Mayor Tate said. “You are setting a great example to your family and neighbours. “I would have to say to the people of the Gold Coast that if you are thinking of getting a pet that from my experience there is nothing more honourable than rehoming.” The Mayor’s family was looking for a companion for their American Bulldog Jai Dee (pictured far right). “We wanted to adopt a good sized dog as they are harder to rehome.” AWLQ Dog Rehoming Supervisor Megan Payette knew just the dog for the family; Boss, (pictured right) a timid 17 month old Sharpei Boxer cross, surrendered by his owner in December. “He needed to go home with a dog friend to give him security and guidance and he needed a family who would be very patient and nurturing,” she said. “We met Boss. He was underweight, shy and I just thought ‘no one will take him’,” Mayor Tate said. It’s the second dog the Tates have adopted from AWLQ. Two years ago they adopted the aptly named “Tatey” a Bull Arab Great Dane cross. “He was about six years old and he was quite neglected,” Mayor Tate said. “The AWLQ team told me that he had health issues I said ‘don’t worry about it’. If you have room in your home and heart for a furry family member, CHOOSE TO ADOPT. What a fabulous year Animal Welfare League Queensland’s Golden Hearts Seniors’ Pet Support Program had last year ending with a finale of a Christmas morning tea for its members. So many turned up with their dogs for a wonderful morning with great food, great company and even a photo with Santa! “Golden Hearts events are a nice way for our members to meet and mingle with like-minded people,” said Golden Hearts Manager, Jacquie Kennedy. Last year we saw some wonderful adoption stories of little dogs finding new homes with Golden Hearts’ members. More importantly we were able to help many who had to go into hospital urgently. AWLQ’s Golden Hearts Seniors’ Pet Support Program gives our members peace of mind with pet ownership. It’s free to join and is to support people 65 and older. Upcoming Special Events & Social Calendar Not only does Golden Hearts hold special events for its members throughout the year, we also have some AWLQ supporters put on special fundraisers on our behalf and you don’t have to be a Golden Hearts’ member to attend! The White Sunglasses Club for example, has been fundraising for the Animal Welfare League Queensland for more than ten years now. Each month, it holds a special ladies’ luncheon at a different restaurant around the Gold Coast. Each luncheon with its own theme. Don’t worry gentlemen, you also get to attend two a year as well! It’s $10 to get in, which goes directly to the animals and then you just buy your own food. Community turns out and adopts AWLQ Project Empty Shelter The fourth annual AWLQ Project Empty Shelter weekend has been hailed a success with 234 animals rehomed for Christmas across four shelters thanks to generous community support. “A Brisbane based mother and daughter arrived at the Gold Coast Rehoming Centre at seven in the morning to ensure they adopted Bruno the stunning Weimaraner cross Australian Kelpie,” AWLQ State Rehoming Manager Melinda Phipps said. In an emotional weekend for staff, volunteers and supporters, 123 dogs, 105 cats, one bird, one fowl and four guinea pigs were rehomed with the public lining up at the doors well before opening time. The adoption fee for an adult dog was $50, $20 for cats. That didn’t stop people coming in for puppies and kittens though. “By 10am more than 70 people were waiting outside that shelter. AWLQ Ambassador Gold Coast Titan Chris McQueen greeted waiting supporters, signed autographs and he and his partner Nicole chatted with other animal lovers. “The level of support for the day was incredible,” Chris said. “We had such a great time we stayed all day Saturday and came back on Sunday. “I’m so excited and proud of the work the AWLQ team does.” In the first hour 37 animals had been rehomed. That climbed to 69 by noon and 92 at 1pm. By 2pm, 117 animals had been rehomed, with the doors still open for adoptions until 5pm. Local radio station Nova 106.9FM kept the music pumping and RACQ was also on site at the Gold Coast offering three months’ free pet insurance to eligible AWLQ pets. Purina, which provides the food for our shelter pets, was available for advice on the correct diet for new adoptions. Another year of increased rehomings and lifesaving intervention The stats are in and we are very excited to have been able to help so many more animals get that second chance at life! In 2015/16 financial year AWLQ cared for 18,690 animals in Brisbane, Ipswich and on the Gold Coast. This is an increase of 1,254 animals in care, or a seven per cent jump. In Brisbane animal portraitist Stephen Gallagher was on site selling images of longterm dogs adopted over the two days. “We were also so grateful to Olympic Champion and our Ambassador Sally Pearson for finding the time in an incredibly hectic schedule before returning to competition to launch Project Empty Shelter this year. This level of commitment to these animals in need is inspiring,” AWLQ CEO Denise Bradley said. AWLQ’s social pages were also filled with images all weekend of new pets settling in. The major increase was in felines, with an additional 1,092 requiring AWLQ’s lifesaving intervention. Six hundred and fifty-six of these were kittens; the remainder were 436 adult cats. An extra 120 dogs were also cared for by AWLQ; 92 of these were puppies. The rehoming staff, volunteers, foster carers and management have all played an incredibly important role in this achievement. We would also like to thank each of you who fundraise, donate and those who #choosetoadopt. Each time you make that decision you are saving a life. Collins Food Limited Collins Foods Limited staff and management continue to surprise and support AWLQ in many ways. AWLQ is one of CFL’s nominated charities in both Workplace Giving and their Spare Change Program. In showing there is no limit to their generosity CFL recently donated laptop computers for our charity’s use. Chief Financial Officer, Nigel Williams attended our Gold Coast Rehoming Centre to volunteer for a day. From washing dogs to cleaning kennels Nigel had a true experience of what it takes to work behind the scenes at a rehoming centre. Pictured page 9 (see facing page). How a workforce can change the course of a charity in need The saying is ‘every little bit counts’. We here at AWLQ are testament to that. Without ongoing donations Animal Welfare League Queensland’s lifesaving work would stop. What does it do for your staff? Workplace giving is a simple, automatic, regular pre-tax donation from your pay which provides an immediate tax benefit. Workers enjoy an immediate benefit to their bottom line while making a difference to our ability to continue our charity work. There are many ways to make a difference to the lives of the more than 18,000 animals coming into our care annually. One way, which has become incredibly significant, is Workplace Giving. What does it do for your business? Studies show that the workforce that gives together stays together. What is Workplace Giving? Workplace Giving is a terrific way for staff to rally together, pool resources and make a difference to your favourite charity. Why is it so effective? It’s simple. It all adds up! A donation of just $4.50, the cost of a cup of coffee, from 100 people at one business each week is $450. Multiply that by 52 weeks and that business, and its staff have contributed $23,400 to AWLQ. Businesses often match the Workplace Giving figure, doubling the charity’s benefit. It allows us to plan ahead Knowing a predicted funding bottom line lets AWLQ plan ahead, improve facilities and services ensuring the best possible care and attention for these animals in need. A company of 20 people with a ten per cent annual staff turnover could be spending more than $40,000 per annum covering recruitment costs, training and reduced productivity. An organisation committed to workplace giving can reduce that turnover by up to 50 per cent, potentially saving more than $20,000. Workplace giving and matching boosts employee engagement by empowering your people to support causes around the world which matter to them with easy, openchoice online giving, gift matching and volunteering. You’ll be in great company! Some of Australia’s most recognised businesses and their staff, have chosen to support AWLQ through Workplace Giving. These include: JB Hi-Fi, Starbucks, Collins Foods Limited, Foxtel, Workpac, NTI and of course, our own AWLQ Staff. - Nigel Williams, Chief Financial Officer, Collins Food Limited Animal Welfare League Queensland relies on individuals and businesses in the communities we serve to financially support our charity work. Your generous, regular support will make a direct difference to the lives of surrendered and abandoned animals in our care. From shelter to exercise and vet care you will be helping to keep them covered while they wait to start their new lives. For more information, contact Neil on 07 5509 9057 or bdm@awlqld.com.au. Arloâ&#x20AC;&#x2122;s incredible journey has touched our hearts and shown us that nothing is impossible if you believe. “Arlo can now stand properly, walk properly for short distances and run,” Ms Payette said. “We were able to buy her a life vest which gives her buoyancy and security in the water. “While there are still many hurdles, and months of physio ahead, the community support has changed her life forever.” The additional funds raised from the Arlo GoFundMe campaign will go to the treatment of other animals in need of specialist care. disease. Arlo was making progress as a result of that decision, an exercise regime, hydrotherapy in a backyard pool and the company she was keeping. Ms Payette’s two American Staffies gave the foster puppy the drive to walk, under her own steam. “Arlo loves Junior and Ronda and follows them everywhere,” Ms Payette said. “She is determined to keep up. “My husband built her a wheelchair and she refuses to use it. 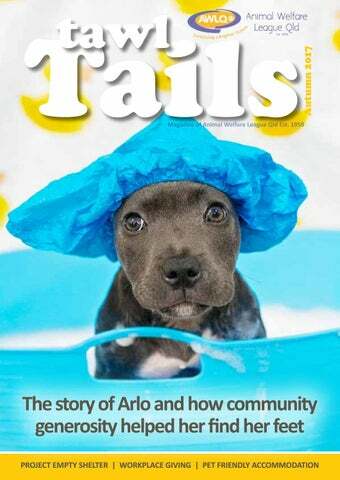 Instead she chases after the big dogs herself.” At 16 weeks Arlo is now undertaking physiotherapy and hydrotherapy in Brisbane weekly. PETS & HOUSING Having trouble finding pet friendly accommodation? You are not alone. Around 25 per cent of AWLQ’s 2,500 surrender intake last financial year was due to an inability to find pet friendly homes. But did you know…in strata-title unit or apartment living, banning of all pets, as well as banning dogs of a certain size or weight, by body corporates has been ruled invalid by the Queensland Commissioner (Body Corporate and Community Management). As well, tenants have equal rights to owners in regards to keeping their pet. “It seems that far too many body corporates are either ignorant of these rulings, or are choosing to bluff their way through to prohibit pets, even though this has been ruled as unreasonable,” said Kim Jordan of Park Avenue Strata Management. A body corporate committee is required to consider the circumstances of each case and be reasonable in the decision it takes. The primary issue for a body corporate considering a pet application is the likelihood of an adverse impact on common property or any person. Where there are genuine concerns, the imposition of reasonable conditions on keeping the pet may be more reasonable than outright refusal. However, Queensland rental properties owners can still say “no pets” in the lease. The Queensland Residential Tenancy Authority states that pets are not favoured among homeowners with just ten per cent of the state’s rental properties allowing pets. This has led to leading industry bodies, including the Real Estate Institute of Queensland, to call for more property owners to consider allowing pets. You can never put a price on a life. That was never more apparent than with Max the Border Collie. The eight year old cream and white border collie came to AWLQ as a stray in early July, with a beautiful nature, a wonderful rich creamy white coat, and a severe, crippling case of chronic ear infection. “It would have started as a simple ear infection, but untreated it lead to a chronic scarring in the ear canal,” AWLQ Shelter Vet Dr Sophie Colonna said. “It’s hard to treat because the inside of the ear closes up. “He was in lots of pain and his hearing was affected.” Despite repeatedly draining and treating the ear the infection continued. A specialist was also consulted. As an older dog, Max’s adoption fee was just $150. The specialist alone was $220. “It costs, on average, $600 to rehome each animal in AWLQ’s care. If we could help Max we would, and so we explored all avenues,” CEO Denise Bradley said. clean. There would be dozens of stitches and three days of wearing a patch and ear bandages. It would take two weeks for Max to recover fully. In the meantime something wonderful was waiting for him. “His foster carer Lee rang to check on his recovery progress and asked if she could adopt Max,” AWLQ Gold Coast Rehoming Manager Nicole Cannon said. “We were so excited!” Lee Painter and her husband had made the choice to foster AWLQ dogs in need after their own loss. “Our doggie died earlier this year so I just thought I’d foster until I was ready…and that was the end of that!” Max was adopted at eight years, three months and three weeks and comes with a few ‘older man’ traits. Lee has had dogs all her life and is already ‘sorting him out’. “He walks about eight kilometres with me each day and his arthritis has improved so much since then. THANK YOU FOR YOUR KINDNESS Lee and her family also donated $1,445 to AWLQ! Could your dog do with some manners or finishing school? Having a polite pet is more than just having a dog or puppy which can sit and shake hands. It’s about a social, engaged dog which is confident in public and well behaved. Socialisation is critical to your dog’s demeanour and attitude to other dogs, and people. With March being Polite Pets’ Month we thought we’d run through some of the critical areas with our AWLQ Education Team to help you ensure your dog is both safe and happy. •	Start early…if you have adopted a puppy then that’s the best time to begin to educate your new family addition on what is acceptable behaviour. •	Start immediately…if your dog is adopted at an older age it’s imperative that you set boundaries immediately, but gently. AWLQ has a series of booklets available on-line to help you with the process – visit awlqld.com.au. •	Stay strong…it’s important that your dog knows the boundaries of behaviour and that you maintain them. Our Education Team says treats can be a critical element of ensuring your dog or puppy learns the ropes initially. •	Stay committed... Join a dog obedience club or find a reputable trainer…this will help create a bond between yourself and your new dog and start you both on your life-long journey of good citizenship. Register now for AWLQ’s Dog Behaviour Seminar! Join AWLQ’s Education Team on this interactive and informative evening in order to better understand your dog’s behaviour and body language. This will enhance and build on your relationship and bond with your dog. BOOK ONLINE Shelter Rd, Coombabah 42 Tiger St. West Ipswich awlqld.com.au All locations have EFTPOS facilities. Proceeds made go back into our rehoming centres. What led you to work at AWLQ? I worked for a vet nurse for 15 years in Far North Queensland. After moving to the Gold Coast seven years ago I missed working with pets. So I found a position at AWLQ’s Community Vet Clinic as a receptionist. Is there something in particular that you love about working at AWLQ? I love the dedication of the vets, nurses and staff. They work hard, without complaint, making sure the pets are treated with the best possible care and their owners are treated with respect. What improvements are you particularly proud of at AWLQ? I have seen lots of change, but the most recent one is the opening of our new cat rehoming centre. It’s so beautiful. The other is the Golden Hearts Seniors’ Pet Support Program, which is great for our seniors. Have you adopted any pets from AWLQ? I got my little Toy Poodle, Cooper, from AWLQ. He’s six years old now and he’s adorable. My old cat of 17 years has just passed away. I’m not ready yet, but I keep walking past all the cats in the shelter and although no one would take the place of Libby, I’m sure within the next year I will be adopting one of those beauties. We have lots of fabulous supporters here at AWLQ. Some of them are teenagers like Emily Weber. Emily spent the last ten months of her spare time at West Moreton Anglican College making hair decorations to raise funds. The year eight student made and sold 433 decorations as part of her school assignment, the $10 Talents Challenge. While the assignment wasn’t due until Term 3, Emily wanted to get a head start so she could raise enough money to help her chosen charity buy something worthwhile. Emily raised an incredible $1,133 for our AWLQ Ipswich Community Vet Clinic to purchase a much needed mobile suction pump with rechargeable battery. The unit can administer suction to a patient anywhere in the clinic clearing throats easing their ability to swallow, and more importantly, breathe. We can’t thank Emily and the Weber family enough! And in further good news Emily has also decided what she wants to do with her life saying that she wants to be vet when she grows up. Emily Weber and AWLQ Ipswich Community Vet Clinic Director Dr Dean Tait. Hip Hooray for Mika - A Foster Carerâ&#x20AC;&#x2122;s story. Being a foster carer, a scrawny, black tortie was brought to my attention in early October of 2016. The one thing that stood out about Mika, as she later became known, was how affectionate she was from our very first interaction on the volunteer shift despite her condition. Mika came to AWLQ with a severely dislocated left hip. It was an old injury in a young cat which did not receive proper treatment. Thankfully for Mika, her luck was to change forever. She came home on foster before receiving the intensive surgery required to repair her hip. Mika continued on with her surprises. Mika was not fazed by our dogs, or other cats, or even small children. If anything, she sought out their attention and loved to play! What stood out most were her dog-like tendencies and undying affection towards humans. Challenges were to come, however, as her surgery and recovery process were going to be tough. you have Mika who could run and play without visitors even realising what she had been through. It was time for this beautiful girl to find a forever family in time for Christmas. Mika became available for adoption just prior to AWLQ Project Empty Shelter. It was very hard to say goodbye. Luckily for her, a couple with children and a small dog became smitten during the promotion. They originally came for another cat but Mika won them over. From a rough start and long recovery, Mika landed on her feet in her new life with endless cuddles, pats and playtime. - By Emma Clignett is a foster carer and has been a volunteer at Warra Animal Rehoming Centre for two and a half years. She is a university student training to be a doctor. Help fund our lifesaving animal welfare work. Visit awlqld.com.au to donate today! Bear Grylls the rooster shares more than just a name with the British adventurer. Like his namesake, Bear Grylls the Australorp rooster managed to spend weeks in the bush without starving to death or being eaten by wild animals. Roosters are often hard to rehome because only one rooster can be on a property more than 4000sqm. Rangy rooster Bear Grylls drew national headlines after he survived five weeks in the wildness after being dumped outside AWLQ. It was an incredible achievement given chicken is very much on the menu of pythons and other animals living in the reserve. Beenleigh Rehoming Centre - dogs, cats and livestock all in a day’s work Most people only think of abandoned and surrendered dogs and cats needing homes in AWLQ’s rehoming centres. But our shelters also provide lifesaving care and rehoming, for livestock. Beenleigh is the epicentre of our farm animals. “We get chickens, roosters, sheep, goats, geese, pigs, you name it, we get them in,” AWLQ Beenleigh Supervisor Helen Andrews said. “And there are some amazing personalities amongst them. “You really can’t go past Mr Bo Jangles.” Mister Bo Jangles was a male pig but far from ‘boaring’. He always came running when he was called, squealing in delight. He would sit and wait politely for his food, walked nicely on his harness and absolutely LOVED his skateboard. That skateboard might have to be upsized though as this little piggy is a Landrace pig and could weigh more than 300 kilograms when he becomes fully grown. This lovely boar is currently in foster to adopt. Then there was Eddie who was very steady. He forgot to read the memo though that he was not a dog but was in fact a goat. He would follow the rehoming team everywhere and the minute you put him on a lead he would strut his stuff like he was on show. Lucy Goosey was also an absolutely charming guest. A very quiet unassuming goose, Lucy loved nothing better than to sit on her human’s lap and have a good snuggle. Sir Elton was a very charming peacock. He had the biggest crush on one of the staff members Emma, and would follow her everywhere doing his very special peacock dance and showing her his magnificent tail feathers in the hope that his love would be reciprocated. These are just some of the livestock which pass through our doors on their way to lifelong homes. The Power of Workplace Giving Simple. Effective. Tax Deductible. For the price of one cup of coffee every week, you can make all the difference to the life of an animal in need. Your small change makes a big difference. BURLEIGH - Ph: 07 5568 7677 Cnr Gold Coast Hwy & Elder St.
All profits raised from AWLQ Op Shops go back into the rehoming of stray and abandoned animals. WE URGENTLY NEED YOUR SUPPORT. Without the generosity of our donors, AWLQ could not continue to operate. As a registered Deductible Gift Recipient (DGR), any donations over $2 are tax deductible. Your donations allow us to continue our welfare work and aids in the care of more than 17,500 animals that come into our care each year. With your support, we are able to give animals a second chance at life. I request/authorise AWLQ to arrange for funds to be debited from my account at the financial institution shown above according to the schedule specified above and in accordance with the terms described below. YES - I would like to be added to the mailing list and kept up to date with AWLQ news! If you wish to make changes to the drawing arrangements, contact our Accounts Department on (07) 5509 9045 at least five (5) business days prior to the next due date. These changes may include: deferring the drawing; altering the frequency; altering the amount; stopping an individual debit; change of account details; canceling the automatic payment completely. AWLQ does not share your personal information. Leave a Legacy...Leave a Gif in your Will. A bequest to AWLQ ensures our work can continue, guaranteeing the future of abandoned and homeless animals is secure and bright. Find out how you can leave a lasting legacy to animals. Our promise to you is that we will never put down a healthy pet. Please help us with a gift in your will. Each year Animal Welfare League Qld rehomes nearly 9,000 surrendered and abandoned animals. We are leaders in the field of rehoming and will never euthanise a social, healthy or treatable animal â&#x20AC;&#x201C; whatever its age. By leaving a gift in your will you will be helping us continue a lifesaving commitment which began in 1959. 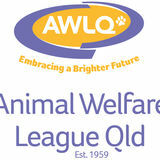 Become part of the AWLQ family and make a difference for animals in need.